On 22 August, the BFI releases two more titles in its established strand, The Adelphi Collection. The astonishingly titled Fun at St. Fanny's (1956) and You Lucky People! (1955), both directed by Maurice Elvey, are (not my words) "rib-tickling 50s comedies," both of which feature top British comedy names from the time, including Tommy Trinder and Gerald (Billy Bunter) Campion, as well as fresh-faced turns from Ronnie Corbett and Rolf Harris. Schoolboy howlers abound in this unforgettably odd vintage classroom comedy caper, starring radio favourite Cardew 'The Cad' Robinson and a host of familiar British film and television faces of the time. Gormless 25 year-old Cardew, wealthy beneficiary of the Robinson Will, should have left St. Fanny's School many years ago. However, seedy headmaster Dr. Jankers (music hall favourite Fred Emney) is in the toils of shady bookmaker Harry the Scar (boxer Freddie Mills) and has so-far kept his golden goose perched firmly at the bottom of the class. Blissfully unaware of nefarious intrigue around him, Cardew continues to flirt coyly with the French mistress and gamble for school dinners on the form room roulette wheel. But canny Scots solicitor McTavish has been sent to investigate. 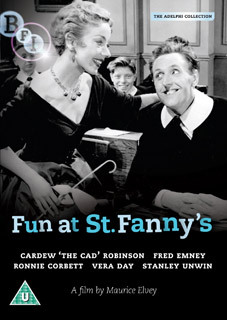 Fun at St. Fanny's features television's Billy Bunter, Gerald Campion, the fabulous Vera Day, Will Hay cohort Claude Hulbert, muddle-mouthed Stanley Unwin, a young Ronnie Corbett, and enough old jokes to fill a Christmas cracker factory. The war might be over but with a mountain of spud bashing to do, some highly irregular night manoeuvres to be carried out, and romance in the air, it's just one skirmish after another around this highly active army base. Will Tommy make it back to civvy street in one piece? Also amidst the ranks of unwilling recruits is a young Rolf Harris, armed only with a pen, risking the Sergeant Major's wrath with his caustic caricatures. Fun at St. Fanny's and You Lucky People! 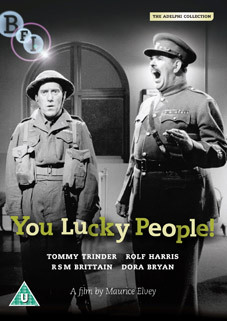 will be released on UK DVD by the BFI as part of their Adelphi Collection on 22nd August 2011 at the RRP of £12.99 each. No extra features have been listed for either film. The next releases in The Adelphi Collection, in January 2012, will be The Great Game (1953) by Maurice Elvey and Miss Tulip Stays the Night (1955) by Leslie Arliss, both of which star British blonde bombshell Diana Dors.